If the Court of Appeals had applied the correct rule in Crane’s case, it  should have reversed her conviction. Why? Because the correct rule would have required it to conclude that the error affected the outcome of the trial, unless the prosecution could have satisfied it beyond a reasonable doubt that it did not. I demonstrated how that was an impossible in Crane’s case. So much for exculpatory DNA testing   . .   .
Cross posted from my law blog. My lawyer, who is about as useless as a steering wheel on a mule, calls me out to have a conversation. I have lost confidence in my lawyer, and I do not trust him. But, I am stuck with him and whatever surprises he brings. As I walk down the hallway, I try to get a glimpse of Harry, who, as usual, is shouting and begging for someone to help him, from his isolation cell. I cannot see him. I wonder if Harry has a real name. In the conference area, I seat myself at a small table, across from my lawyer. He says, “Did you hear anything about your sentence? How it is four years and not eight? I watch the lawyer pick up a law book, that I have already looked through in the jail ‘law library,’ and thumb through it. He locates a statute that I have already read, and begins to read the statute to me. I let him read it, and I listen as though I have never heard it before. The comment, “She could be naked, riding on an elephant through the middle of town at noon, singing a song about heroin” was made after the suppression hearing. Ironically, in an inappropriate yet darkly humorous way, the judge was pointing out that it is not illegal to mention the name of a controlled substance, or to even sing a song about a controlled substance, while riding an elephant down the street naked, at noon. He is correct, of course, because we have a First Amendment right to free speech, and mentioning something about [insert the name of a controlled substance here] is not illegal. Why, then, after making this comment, did the judge deem such free speech an illegal act? We do not know the answer. Also of interest: Herion was the subject of a front-page news story in the area, just prior to my arrest. Chris McNeill refused to show the article to the jury during my trial. Also, Chris McNeill failed to include the transcript of the preliminary hearing in the record on appeal. The preliminary hearing transcript contained McCracken County Deputy Eddie McGuire’s under-oath statements shortly after my arrest, and the statements differed dramatically and materially from his statements later on, also under oath. I had to file a motion with the Court of Appeals to include the preliminary hearing testimony, so that the Court of Appeals could see how Eddie McGuire changed his story. The motion delayed my appeal for a year, while the Preliminary Hearing transcript and testimony was included in the record. I was stunned when I learned that my own lawyer had made such an omission and created the one-year delay. Written by Masoninblue and reblogged from frederickleatherman.wordpress.com. Until tomorrow   . 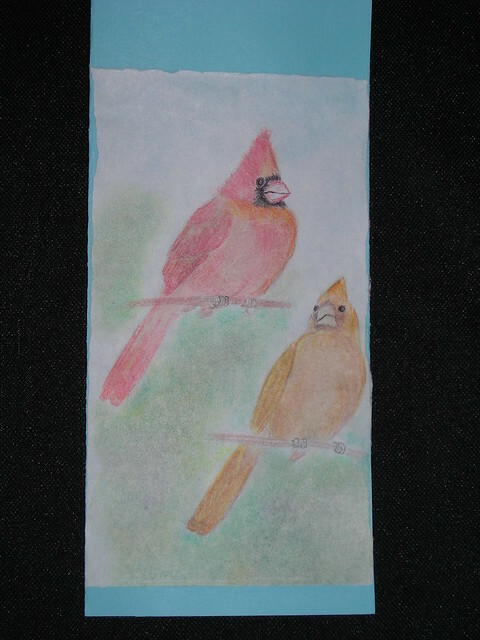 .   .
Cardinal Couple jail art by Crane-Station. I will be posting new art soon. Our camera issue is only temporary. I am off to see my birds. They have their nests built, for the most part, and now they are mating and having chicks. A dove pair lives near the library. Another lives near the grave of Columbus Dorsey, the young man who is buried outside the Horticulture greenhouses. This dove couple had a chick, that was beaten to death with a broom, by an inmate. I interrupted the beating and tried to save the baby dove, but I could not, and so I left it near its nest and near the grave of young Columbus, where it died. The other baby dove, the one that a guard stomped to death on the ball field, remains at rest underneath the tree where it the officer killed it. The robins are here, and so it is Spring, because robins have returned from winter migration. Robins are stout birds that keep to themselves and hunt worms; they are not interested in scraps or bread. This morning, when I was in Horticulture class and we were digging and planting in an area between the chapel and the dining hall, the robins watched us dig, from a vantage point near the chapel. When we finished, the robins moved in, rooted through the freshly dug soil, and stuffed themselves sick with earthworms. Amazing that they could even get themselves up off of the ground after their worm bacchanal. On occasion, I see the blue halves of robin eggs, after the chicks have hatched. Starlings, along with crows (and seagulls), are the birds that Alfred Hitchcock featured in Alfred Hitchcock’s movie, The Birds. Starlings were introduced to this country and they are generally hated. Starlings are accomplished mimics and vocalists; they answer me specifically. The people who hate starlings describe them as ugly, but I believe they are beautiful, with their glossy coats and their mercurial flock formations that at times make the sky seem fluid. A starling flock can have tens of thousands of members. They do not care for crumbs, but they do enjoy hot dogs and bologna when I have it. Bluebirds are shy, and they often encounter difficulty with competition with sparrows for nesting space. There is a way to offer bluebird housing that is specific to bluebirds. (Perhaps someone can share their experience.) Bluebirds are not interested in scraps and crumbs, but their presence is uplifting. Sparrows are regular customers for crumbs. They are loyal and entertaining. When a sparrow once became entangled in some string, Officer Carbey untangled it from the bird’s foot. The bird was quiet during this procedure, and I think it knew that the officer was trying to help. There are, it turns out, a good many kind-hearted officers working in the prison system. There are many other birds here: swallows, chimney swifts, mockingbirds, cardinals, woodpeckers, and even the occasional heron. I spot a baby bird that has fallen from a nest just outside of Ridgeview Dormitory. I pick it up. It is a hatchling that is so small I can cup it in my hand. Its eyes are not open, and it has no feathers, so I cannot identify what kind of bird it is. I place it back into the nest above the area where I found it. The next day the tiny, naked creature is back on the ground. I assume that something is wrong with it and that it has been forced out of the nest due to its weakness. I decide to keep it warm, and I decide not to tell anyone, not even my roommate, for fear it that a guard or inmate will find out and stomp or beat it to death. The bird cranes its neck and makes a peeping sound that is barely audible. It raises its naked wing knobs. I make a warm place for it, hide it in my room, and offer it some sugar water. The bird dies the next day, but at least I know it was warm and as comfortable as it could be. I decide that someday, somehow, I want to make a life with birds, and have a sanctuary. How Could Judge Taylor Forget Garcia v. Commonwealth? Written by Masoninblue and reblogged from frederickleatherman.wordpress.com. If you are not following the legal case but you are looking for a Frog Gravy post, please go here. written by Masoninblue and reblogged from frederickleatherman.wordpress.com. If you are not following the legal case, but you are following Frog Gravy, please refer to The Bat: Frog Gravy 73.